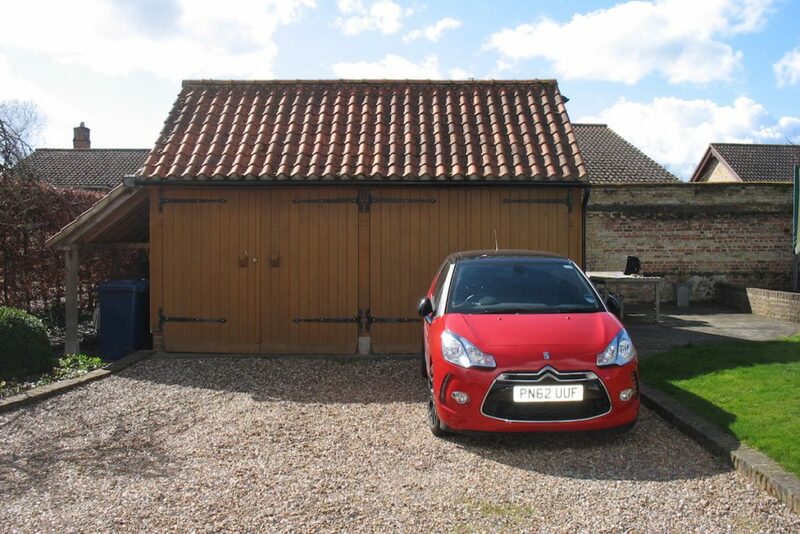 Fulbourn Garden Room Garage Extension. 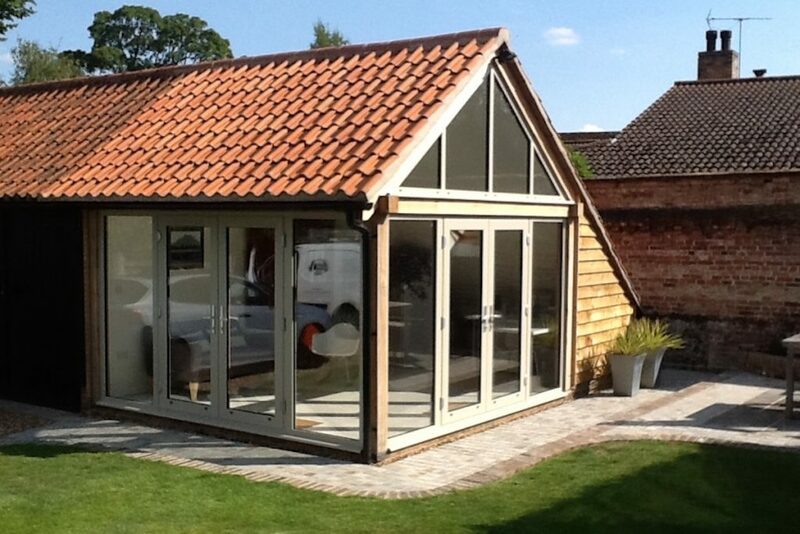 Many people want to build a conservatory, orangery or garden room that is attached to the main house. But in this case, the owners of a Fulbourn property wanted to have a separate garden room that would double as an office. As they already had a detached garage that was adjacent to a patio area, it made sense to build a garden room from the same materials as the garage. Sited next to a beautiful old brick wall and clad with larch and roofed with terracotta tiles, the building already had a distinctive style. To make the best use of the light that would naturally flood into the new space, we designed a gable end window to sit above a set of wide French Doors which open to the patio to the side of the driveway. On the driveway side, we included an identical set of French Doors to make access for visiting clients simple and obvious. With just a timber post between the two sets of glazing, the space is light while providing all the practicality the owners require. 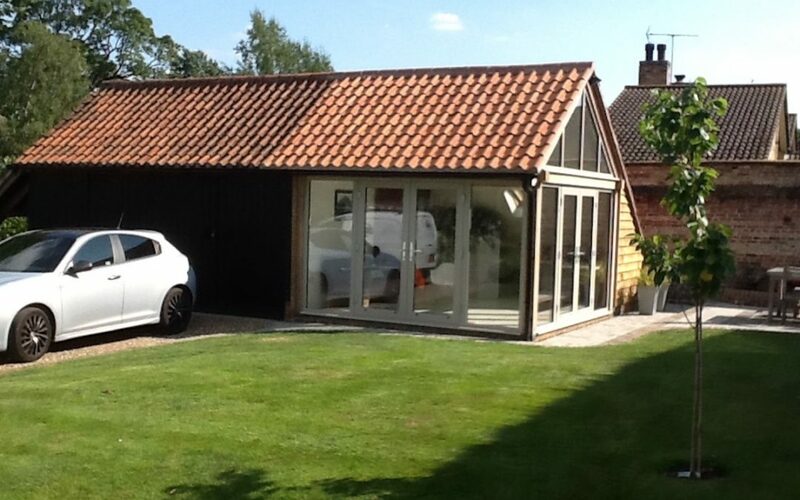 Accessed from either the garden or the driveway, this multi-functional Fulbourn Garden Room really delivers. The owners selected a pale traditional grey green that works beautifully with the larch cladding, the terracotta roof and connects the old brick wall to the new space providing great continuity between the various elements. Brick paving forms a curved path from the driveway around to the patio without impacting on the grassed area of the main garden. On sunny days when the doors are open, this space truly does feel like part of the garden. I couldn’t imagine a better place to work from home than this fabulous Fulourn Garden Room office, can you? And the owners are just thrilled with this space too!